This entry was posted in Algebra, Statistics and tagged probability, quadratics. Bookmark the permalink. I am surprised that the percentage is even that high. Please let me know if you pursue this, and how it works out. How large did you allow the a, b and c to be? a,b,c were allowed to each go up to 20. It would be a fairly easy task to allow them to go higher and perform a bigger simulation, but I suspect there must be a more direct proof. Allowing the coefficients to be integers as large as possible, the probability is exactly zero. Here’s why :Look at the discriminant, square root of b squared minus 4ac. 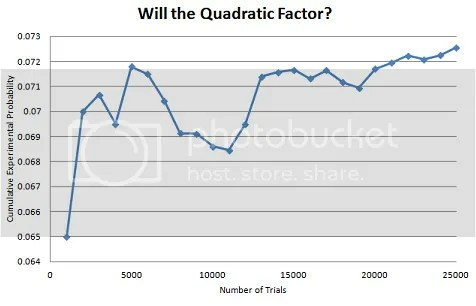 If that number is rational then the quadratic can factor (over the integers). If the discriminant is irrational then the quadratic can’t factor. But the number of rationals is countable (aleph-null) while the irrationals are uncountable (a “larger” infinity). So the ratio of factorable to unfactorable quadratics is zero.